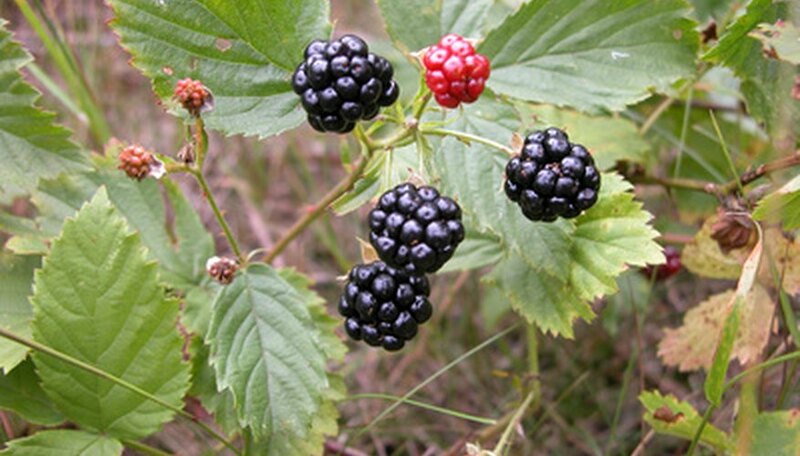 Although some farmers grow blackberries as a commercial crop, in commercial forest settings such as a tree farm or timber stand, blackberries and bracken fern are considered nuisance weeds. Bracken fern fronds may grow up to 10 feet long, while blackberry brambles are filled with thorns. Both plants can make it difficult to move between trees and make even choke out young seedlings. A mass spray of an herbicide that targets woody stems could also damage cash crop trees. Instead, farmers must be more selective in their removal methods. Lop off stems of bracken and blackberry brambles near the ground level with a pair of branch loppers. Note the location that each type of weed emerges from the ground. Remove all chopped surface vegetation from the forest floor. Bracken ferns may contain spores that produce new ferns. A single bracken fern frond can produce 300,000,000 fertile spores annually. Paint the cut ends of each stem with a systemic herbicide such as glyphosate in fall when the plants pull energy into their roots for winter. In spring, use triclopyr, which is formulated for woody weeds. Painting herbicide directly onto the cut surface will help you to avoid transferring it to nearby vegetation. The blackberry brambles and bracken ferns will pull a systemic herbicide such as glyphosate down into their roots and kill the entire plant rhizome. Dig in the location where each weed emerged from the ground to locate the rhizome of blackberry canes and fern fronds. Remove the rhizome using a shovel or grubbing hoe. Observe the ground in this area for re-emergence of ferns or blackberry canes. Continue to retreat weeds and remove them until the plants no longer return. Repeatedly mowing nuisance shrubs and woody growth such as bracken ferns and blackberry bushes will eventually kill the plants. But in forest settings it can be difficult to maneuver a mower. Additionally, mowers may scrape the bark of trees and cause a decline in tree health. Always wear protective clothing and gloves when working around blackberries. The plants have sharp thorns that can cause injury. Wear breathing protection when working with systemic herbicides and shower immediately afterward. Oregon State University Extension: Blackberries: Friend or Foe?